Monster Go Up is a funny matching game with physics gameplay elements and a catchy background tune. 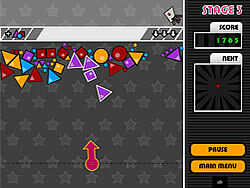 Your goal in this free flash game is to match the shapes in order to smash the monster into the ceiling. There are various shapes under the platform and you have to connect at least 4 of the same color to make them explode and move the platform up.